Israel’s Messenger has featured scores of articles on various Messianic prophecies through the years. These are designed to educate and equip you to share the gospel message with your Jewish friends. Whether it’s our Prophecy Conference, Messiah in the Passover Seder, or our annual Journey to Jerusalem Israel Tour, our major upcomming events and info on how you can join us are always highlighted in Israel’s Messenger. New books on Israel and prophecy, Interesting items from Israel, and products that Jewish Awareness Ministries has produced are often advertised in our magazine. The regular columns “Sowing the Seed” and “Messianic Witness to Israel” recount for you REAL witnessing encounters from our personnel, and include pointers and advice to help YOU witness to your Jewish friends! One of the focuses of Israel’s Messenger is helping our readers to have a biblical understanding of God’s time-table for this world. We also strive to show you how current events foreshadow upcoming prophetic events in our regular feature, Shadows of the Tribulation. In a time when the “Christian community” seems to be “tossed to and fro, and carried about with every wind of doctrine”, we desire to guide you by “rightly dividing the Word of truth.” Correct understanding of Bible doctrine is a major thrust of our magazine. All of our articles are Bible-based. If you would like to renew your Subscription to Israel’s Messenger, click the “Renew” button, and you will be taken to a page where you can purchase your renewal for $9.95. 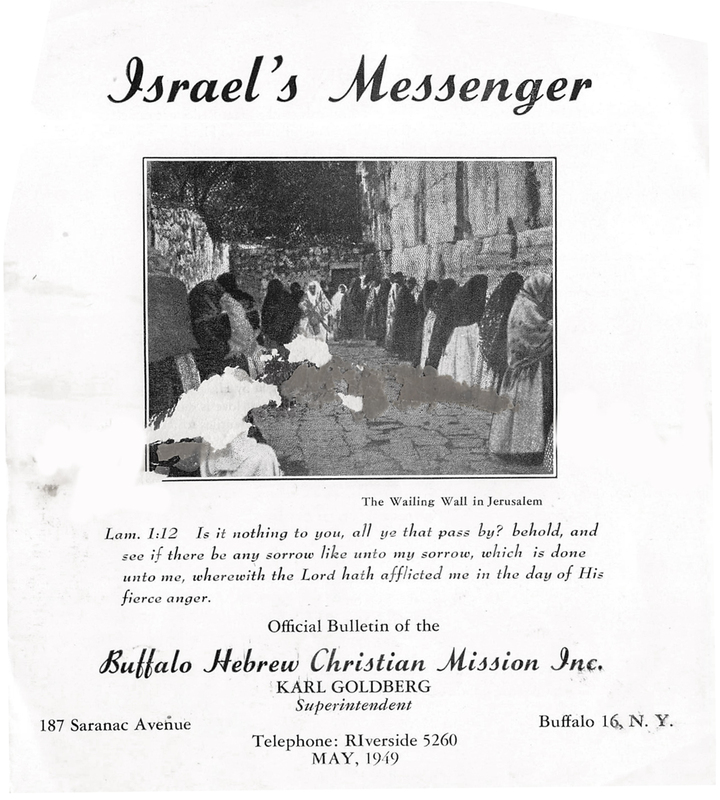 Israel’s Messenger began in 1949 as our Official Bulletin when we were still known as The Buffalo Hebrew Christian Mission. Since that first issue almost 70 years ago, we have published almost 300 issues of Israel’s Messenger. Back then, we were located in Buffalo, NY and Karl Goldberg was the ministry’s Superintendent. The first issue (pictured here) gives updates about the Mission, prayer requests, and a poem about our debt to the Jews, and the neccesity of reaching them with the gospel. We are currnetly preparing a very special Spring 2019 issue, that will comemorate the 70th anniversary of Israel’s Messenger.